August in Texas means heat. HOT HOT HOT temperatures, bright sunlight, and running from door to car to door again in search of air conditioning. But it also means the start of school, and THAT has always been my silver lining. Bouquets of sharpened pencils, vibrant markers, color-coordinated folders and binders. When I was in school, I loved shopping for new goodies, and now that I'm a teacher I wander the aisles with just as much glee. 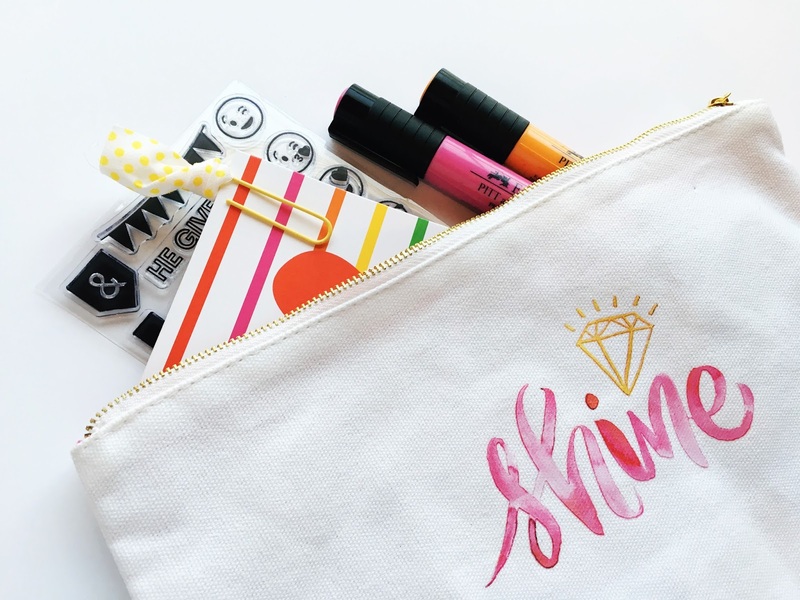 When I saw the newest Sadie Robertson goodies by DaySpring, my stationery loving heart jumped for joy! I can absolutely picture these going with me to and from school and helping in my first year of teaching! 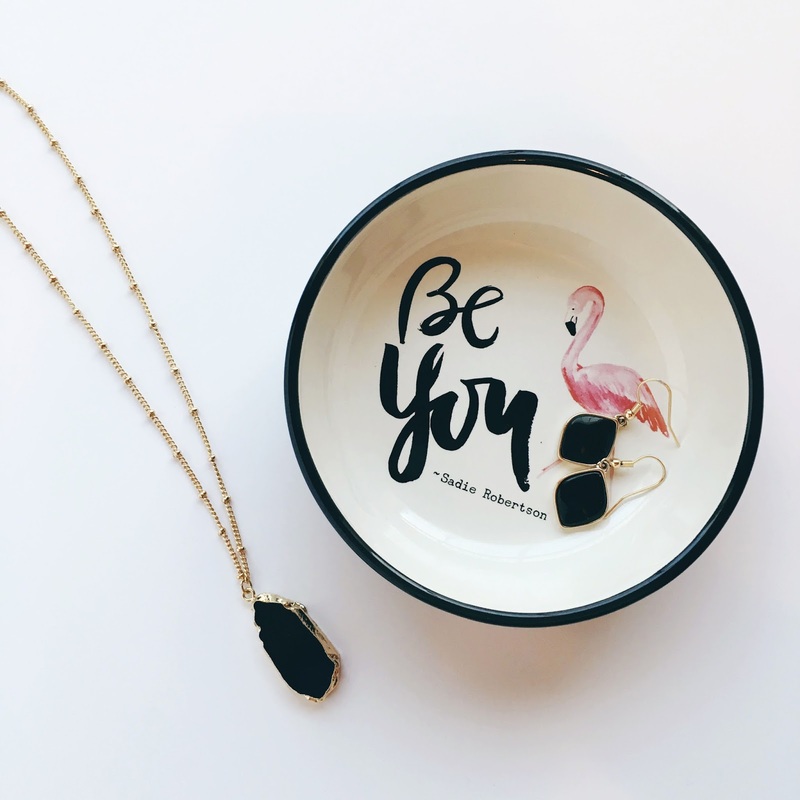 Up next is the ADORABLE Be You Trinket Dish. Shanna shared it in her unboxing video and I swooned! I don't know when it was, but I discovered an affinity for the whimsical and oft-one-footed flamingo back in high school. They're just so fun and quirky! Plus they're pink. I'll never out grow that one as a favorite color. I'm always forgetting to take off my jewelry before climbing into bed, so perching this dish on my night stand catches every stray earring or necklace so I can get some rest. I'm a journal loving kind of girl, and I have been known to fly through them. 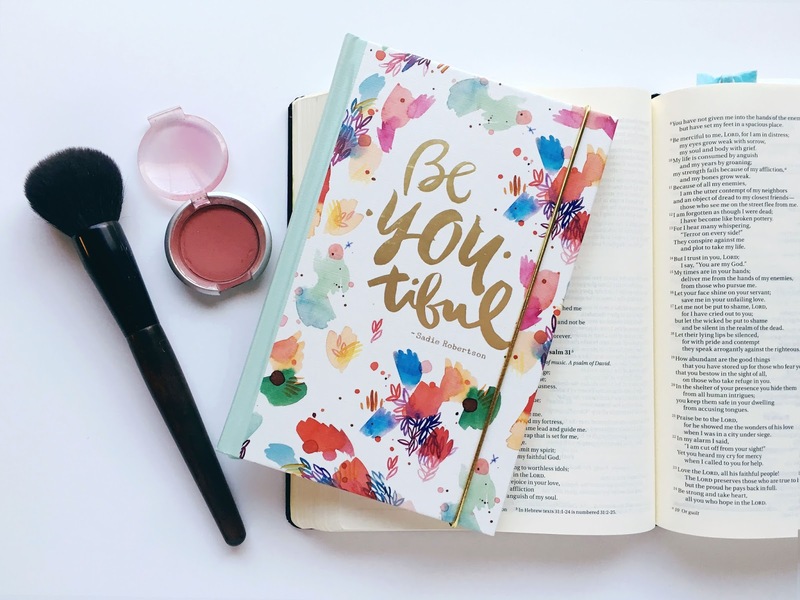 Naturally when I saw the Be You-tiful Journal I immediately set it aside to be next on my list. I've filled around twenty journals since starting college, chock full of prayers, daily doings, song lyrics, and dreams, and I absolutely plan to put this one to work when the next volume comes to an end. I couldn't share these goodies without the school supplies I bragged about at the beginning. 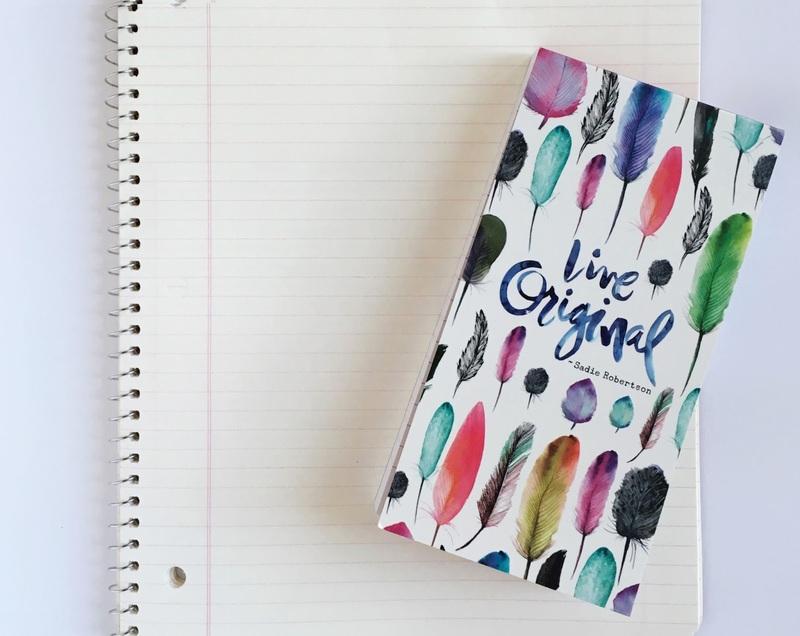 The Live Original Jumbo Notepad is just the ticket! No really, it's perfect for listing to-do's and grocery needs, and I keep moving it from room to room as I have new ideas. Now here's a dynamic duo! 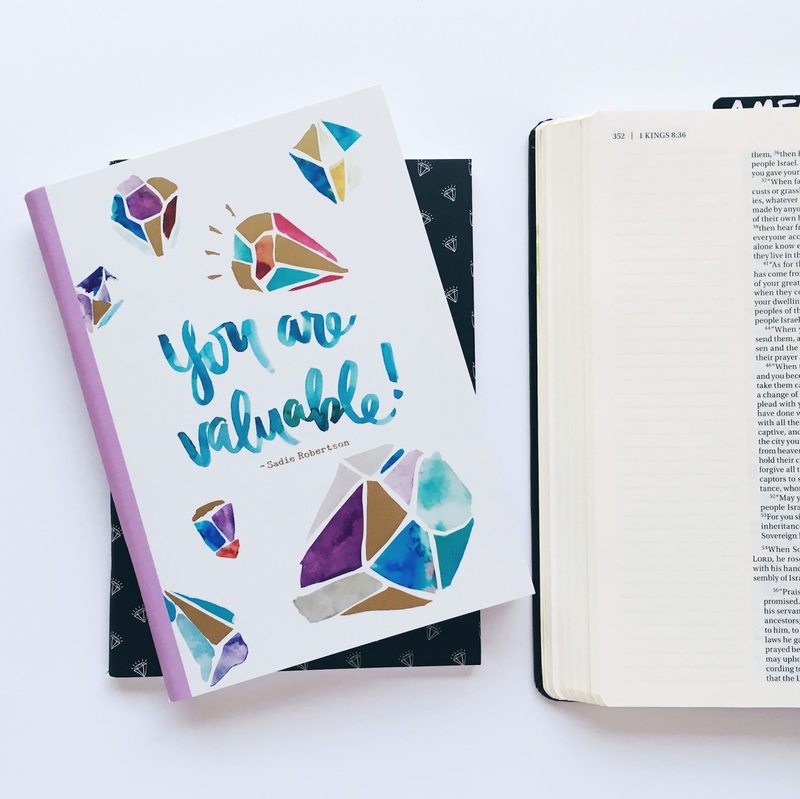 The Shine/You Are Valuable Notebooks have my mind spinning with many ideas for how to use them! Maybe to journal through the new IF kit or to take notes for my lesson plans during the week. I also like to keep a notepad on my night stand to catch any middle of the night revelations or last minute to-do's that I'll forget before morning. The watercolor and gold-foil gem stones are so lovely, I'm going to have such a hard time deciding how to use them! 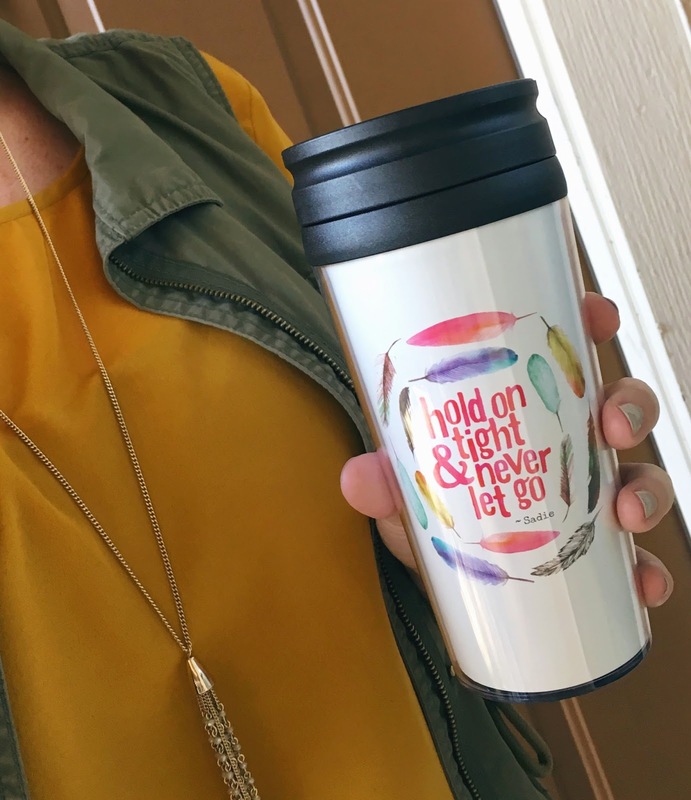 Last but certainly not least, the Hold On Here Travel Mug is a must-have! I'm not a coffee drinker, but I love hot chocolate in the winter and cold tea in the summer to fight away the heat. My drive to work is shorter than the walk from my classroom to the nearest fridge, so I'm keeping my drink of choice in hand on my way to first period. I love that the feather pattern matches the large notebook, and it even went so well with my green and gold yearbook photo outfit, if I do say so myself. Whether you're the student, teacher, anything beyond or in-between, I'm sure one or two of these might make your summer fade into fall with a bit of fashion and flare! I know it's doing a number on my new routine. What's your favorite thing about this season? Anything catch your eye from Sadie Robertson's new collection? The summer sun is a beautiful thing, but I have to admit that it's not always my best friend. Being fair-skinned and light-eyed means I'm constantly applying and reapplying 100+ SPF sunscreen and wearing bug-eyed sunglasses to stay sun-safe. It wasn't until recently that I discovered the wonder that is the giant floppy hat. I gave my first one a try when deep sea fishing in Florida, and I'm sad to say that it flew off into the waves halfway through the day. When I found these gorgeous hats by Eugenia Kim, I fell instantly in love with the sparkly sequins and sassy sayings, but my heart broke over the $485 price tag. No way, no how, was I going to spend THAT much money on a hat I'd wear three months out of the year. But be still my heart, I couldn't get those hats out of my head. It took a little brainstorming and inventive thinking, but I decided to try my hand at re-creating the hat for a fraction of the price. One trip to Target and Hobby Lobby later, and I was set to go! To my surprise it was a piece of cake, and I thought I'd share the details below! Luckily I already had most of the supplies on hand. The only things I had to purchase were the wide-brimmed hat ($14.99 at Target) and the trim/ribbon. I bought one roll of black ribbon for $2.99 at Hobby Lobby, and I bought two rolls of sequin trim for $3.99 each, but I used a 40% off coupon because, well, I could. First, secure the hat to the poster board with straight pins and lay on a flat surface after removing any tags or excess detailing. As you can see here, my hat had a gold braided cord lightly sewn along the cap. I simply cut it loose and set it aside. Second, place the sequin trim in the desired design and secure it to the hat temporarily with straight pins. I pushed the pins all the way through to further fasten the hat to the poster board, and this gave me the freedom to adjust the words to the appropriate style and size without fear of messing up. When you reach the end of the word, cut the sequin trim and secure the end with a straight pin. 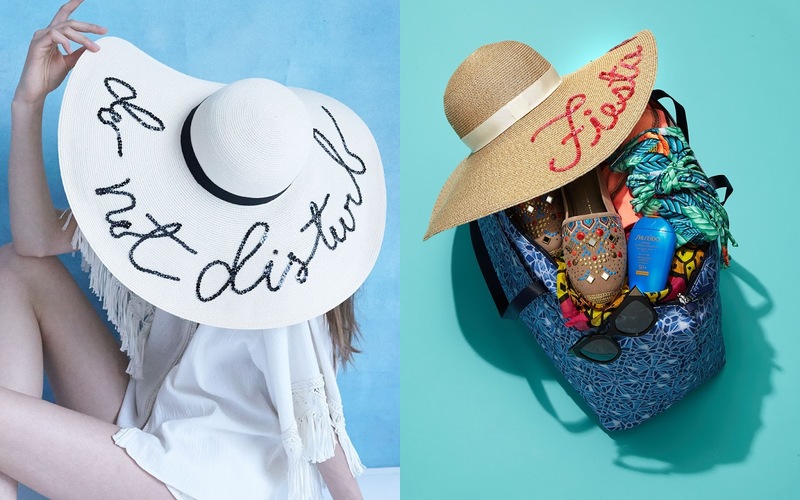 I chose to go with the "Do Not Disturb" style, but I get the feeling the "Fiesta Not Siesta" design will be my next undertaking. Third, lightly trace your design with the pen. I ran the point of the pen just under the sequins one section at a time to know exactly where to place the glue. Fourth, section by section, lift the sequins to reveal the tracing, then run a thin line of hot glue over the design, removing the straight pins as you go. I pressed the sequins in place with the balled end of a straight pen to keep from gluing myself to the hat. Believe me, that happened more than once ;) I personally hate the hot glue gun strings, but leave those be for now. We'll get rid of those later. Repeat steps 2 through 4 until all words are secured to the hat. Use single sequins to top off any fraying ends of each word or to hide thick glue spots. Once your words are in place, cut a piece if 1-inch thick ribbon to run around the cap of the hat. You can hot glue or hand stitch this into place. Finally, Let it dry then lightly blow over it with a hairdryer to remove the hot glue cobwebs/strings. Those things annoy the FIRE out of me, so I'm always glad to see them go. And VOILA! A designer hat DIY for a fraction of the price! Like I said, Fiesta not Siesta is next on my list, and I'm sure I'll post a snap of it sooner or later. I'd love to see your DIY! That's right, y'all. It's back again! No matter how random my weekly posting has been over the past two years, each September I've gotten my stuff together (and so many of you have, too!) and write every day for ONE MONTH. Call me crazy, but even with my first year of teaching starting next week, I'm doing it again, and I'm inviting you to join in with me! To what, you may ask? The 3rd Annual Blog-tember Challenge! Friday, Sept. 2: Share a list of your current goals. Saturday, Sept. 3: Now that summer's at an end, share a list of favorites from the season! Sunday, Sept. 4: What are you up to currently? I have examples here and here. Monday, Sept. 5: What was your most memorable birthday? Tuesday, Sept. 6: Create a playlist. What you're listening to now, what encourages you, holiday favorites, etc. Wednesday, Sept. 7: Five things that bring you joy. Thursday, Sept. 8: A house/apartment/room tour! Give us a glimpse of your space. Friday, Sept. 9: If you could go anywhere in the world, where would it be? Why? Saturday, Sept. 10: A day in your life! Take us through it with you by sharing a photo each hour of the day. Sunday, Sept. 11: Round up of your favorite Instagrammers! Who should we follow? Wednesday, Sept. 14: Make a mood board! Are you brainstorming a room re-do, a capsule wardrobe, or already planning for the holidays? Show us your ideas! I have examples here and here. Sunday, Sept. 18: One product that simplifies your life. Monday, Sept. 19: A list of your favorite blog posts you've written. Wednesday, Sept. 21: If you were a flavor of ice cream, which flavor would you be? Why? Friday, Sept. 23: A family recipe (if grandma allows, of course!). Saturday, Sept. 24: Recreate an outfit or a project from another blogger. Be sure to link back to the source! Sunday, Sept. 25: Review something! A place, a book, a service, a product. Anything at all! And now the invitation. Won't you join me for the #blogtemberchallenge? I know the idea of posting every day can seem overwhelming, but with a little planning it can be totally manageable. Feel free to follow one of the prompts, all of the prompts, or none of them. Some have followed the challenge Monday through Friday, taking weekends off, but do whatever you like! The main goal is to get us all writing together, and we may as well learn more about our favorite bloggers and get to know new ones while we do it! There really are no rules to this. I have provided a button that links back to the prompt page for ease of access, and I will offer a link-up at the end of each of my posts. If you share your posts on Twitter or Instagram, be sure to hashtag #blogtemberchallenge so we can all follow along! If you're in, let your readers know what's coming up and give them the opportunity to join in as well. Report back here on Thursday, September 1, with your first update! Alright, August. Let's do this thing. Last month was overflowing with adventures and blessings! I took my first trip to New York City, I saw eight Broadway shows, and I got a POST-GRAD JOB! Hallelujah! But with all that said and done, August is going to be brimming with new experiences and the second half of a major life transition. I move to my new town at the end of the week and start new teacher training on Monday. "She girds herself with strength [spiritual, mental, and physical fitness for her God-given task] and makes her arms strong and firm." 1. Celebrate turning 25! Done and done! I spent my 25th birthday with Micah in the big apple and then hanging out with her church friends at an "Authentic Austin BBQ" joint in Jersey. It was such a blast! 2. See my first Broadway show! Oh yeah. That happened. And it happened again seven times. Claire and I squeezed in eight shows in six days during our stay in New York. They were AMAZING! I left feeling so inspired and I can't wait to go back hopefully next year! 4. The Contentment Challenge Round 2. Errr... I sort of forgot I was doing this. Or I ignored it. I blame New York and the sales at Anthropologie. Actually I totally blame myself. I could have and should have done better. 5. Finish the move. Well, everything ended up in a storage room in Texas as planned, but the move won't be finished until this weekend. We'll load everything back into a U-haul and drive 200 miles to my new apartment. I can't wait to settle in! 6. Read 5+ books. Ha! This DEFINITELY didn't happen. I started a book or two that I am really enjoying, but I didn't finish a single one of them. I was given Life After Life by Kate Atkinson for my birthday, and it's a fascinating read! I received How to Survive a Shipwreck* by Jonathan Martin from Book Look Bloggers and it is SO GOOD. Such a beautiful book that encouraged me so much during this hard transitioning season. I highly recommend it! *Full review to come soon. 7. Give myself grace. You know, I'm a little hesitant to cross this one off. July was hard. July was good. July was FULL. Grace came from a lot of different places in a lot of different ways, and I do think I was able to ease up on myself in moments. Not always, but sometimes. And that's a win in my book. "But those who wait for the Lord [who expect, look for, and hope in Him] shall change and renew their strength and power; they shall lift their wings and mount up [close to God] as eagles [mount up to the sun]; they shall run and not be weary, they shall walk and not faint or become tired." 1. Move to my new city! Ahhhh! I will be in my new town in three days! It was quite the adventure finding an apartment, especially in such short notice, but I found one that I absolutely love and can't wait to show you the makeover I have in mind. 3. The Contentment Challenge. Fo'real. No kidding, that's how I wrote it down in my PowerSheets this time. I may finally be making "big girl money" but it's time to set that "big girl budget." This time I'm setting specific criteria/rules in the challenge: no fast food, no Target, and any "wants" go on a list on the fridge. If I still want the want next month, I can choose one to purchase with my "extras" category in the budget. 4. Visit churches/life groups. I know from experience how easy it is to let finding community fall to the wayside in a major move. This time I want to make it a priority. I know which church I plan to attend (it's a sister church to the ones I went to in college and in Seattle), and I need to bite the bullet and just start showing up in Lifegroups. Community is a game changer and I know I need it! 5. Illustrate my faith. One of the hardest things about this in-between stage this summer has been falling out of my routine and not making time for what fires me up. Illustrating my faith not only inspires me creatively but it roots me in the Word on a daily basis. Or it did when I was doing it consistently. Luckily even when my travels took me thousands of miles away or when my journaling Bible got packed by accident, I had the "I Am Strong" devotional to keep me company. This month I'm excited to find my routine again and MAKE time in my new routine for illustrating my faith. 6. Read 5+ books. Yup, it's here again. It's going to be a monthly thing. I've read 44 books so far out of my 52 books in 52 weeks challenge, so I'm hoping to pick the momentum back up this month. I want to finish Life After Life and How to Survive a Shipwreck, and I have plans to read Harry Potter and the Cursed Child, Uninvited, Circling the Sun, and I Don't Wait Anymore if possible. 7. Plan The 3rd Annual Blog-tember Challenge. Ahhhhh! It's back, it's back, it's just around the corner! Hosting The Blog-tember Challenge in 2014 and 2015 was SO much fun, and even though I know this September is gonna be ca-ra-zy, I simply can't give it up. I'm compiling my prompt list (taking your suggestions, too!) and I'll post it in a few weeks. My hope is to pre-write 75% of my posts to save my sanity. We'll see how that goes. 8. Ketogenic eating + yoga. Y'all, my body is so much happier when I cut out the carbs and sugar. It just is. Sadly, I listen to my cravings more than my common sense. Putting a NO FAST FOOD sticky note on August and in my wallet will hopefully keep me away from those tempting things and help me stick to the keto plan that has worked well in the past. My new apartment also has a dining nook, but I have no dining room table, so I plan to use that space to try out Holy Yoga again. Caroline Williams Yoga is my favorite! I'll keep you posted. 9. Start a prayer planner. 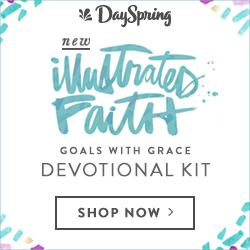 Have you seen the new Illustrated Faith planners?! Oh my stars they're stunning! BUT I already had a Day Designer going as well as a Happy Planner Teacher Planner. 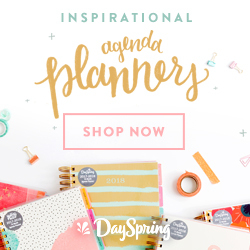 I couldn't see using a THIRD planner in the traditional way, so I'm taking a page out of Shanna's book, as well as some advice from Natalie, and making it a prayer planner. Full details coming to the blog next week! New routines, here I come! Goodness, the thought just makes me giddy! So what are YOUR goals for the month? What do you want to make happen this August? 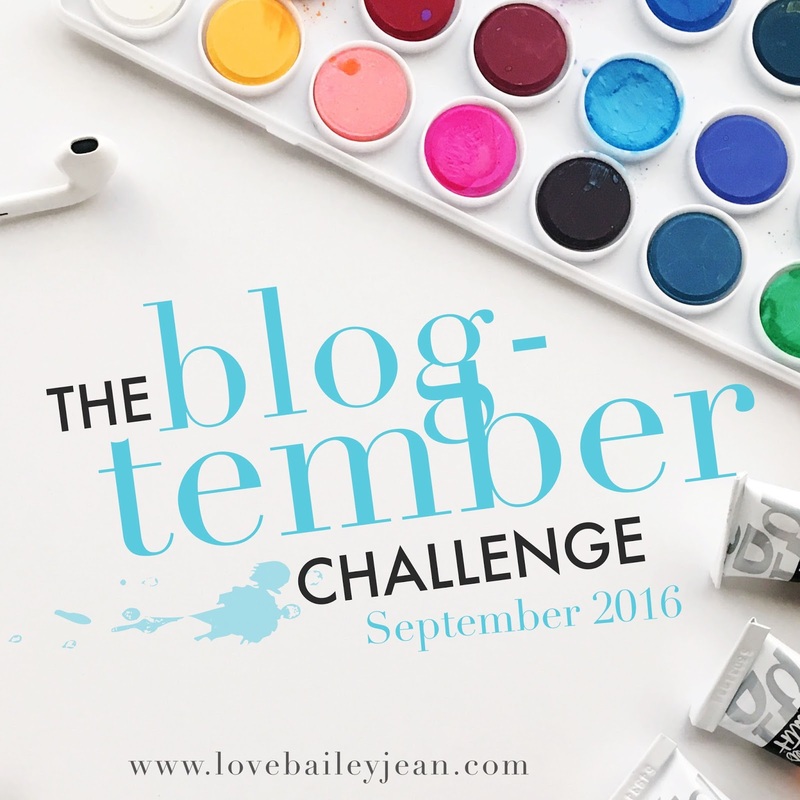 Also, any Blog-tember Challenge prompt suggestions?! ...the text in this post is all kinds of crazy, I know. Random colors, sizes, etc. Oops. *Also, this post contains affiliate links. They won't cost you a penny more, but they may help this first-year teacher buy some extra supplies for her classroom. Thanks and enjoy! My New York City recap would not be complete without a review of the incredible theatre packing my week to the brim! We managed to squeeze in eight shows in six days, and what a whirlwind! I always felt like a fail of a theatre major since I had never seen a Broadway show. I saw national tours when they came through Dallas, Tulsa, or Seattle, and when I studied abroad I saw shows on the West End and at the Globe. But Broadway? Not until two weeks ago. You know me, I could go on and on and on and on about all things theatre, so I’ll try to be brief about each show. Besides, in some cases you simply had to be there. School of Rock: Monday night we saw School of Rock which is based on the movie by the same name. You know, the one with Jack Black? The movie wasn’t my favorite, but it was certainly fun, so I thought I knew what I was getting into with the musical version. Our seats weren’t great, but they were cheap which was fine, but THOSE KIDS THOUGH. Oh my stars, talk about talented! Fifteen to twenty children flooded the stage with talent, and four of them were playing rock music live and do so every night of the show. Talk about incredible! What was I doing when I was twelve? Play with American Girl dolls and passing notes in class. At intermission an usher let Claire and I move to two empty seats toward the middle of the balcony, and we had a much better view of the second act. Something Rotten: This was the show I had been obsessed with for the longest time, wishing for a ticket since I first heard the concept over a year ago. It’s a musical set in Shakespeare’s time, where Shakespeare is a rock star, literally, and a pair of brothers are trying to beat him at his own game. They hear from a fortune teller that musicals are going to be the next big thing, and that Shakespeare’s biggest hit will be called Omelet… he misses the Hamlet mark by one breakfast food ;) Therefore they start writing a musical about, you guessed it, omelets, and hilarity ensues. It was SO CLEVER! The musical references and the Shakespeare references were EVERYWHERE. I laughed so hard I cried and I loved singing along. Easily one of my favorite for the week. The Curious Incident of the Dog in the Nighttime: This show won the Tony award for Best Play last year, and I’ve been curious about it ever since. I rushed the show, which meant I showed up at the box office that morning and asked for a rush ticket, and I snagged the front box seat for only $30. I loved being so close to the action, and there was only one small part of the stage that I couldn’t see, the upper stage left corner. The movement was brilliant, the story compelling, the acting so well done. I was mesmerized. It was a one of a kind experience I will never forget. Finding Neverland: You may not know this but I love Peter Pan. I did several research projects on the play and the playwright in college, I see and read every show I can get my hands on that uses it in any way, shape, or form (Peter and the Star Catcher for instance, another brilliant production!). I loved the movie Finding Neverland featuring Kate Winslet and Johnny Depp, so I had big expectations for the musical. Matthew Morrison (from Glee) had long since left, and we saw the understudy of his replacement. The kids were super talented, but overall I was unimpressed. There were a few magical moments that made me cry, and two songs I adored, but I don’t think many of the design elements made sense together. There was a lot going on and it didn’t quite work. I don’t know how to fix it, but I do know I want to direct the show someday and try to figure it out. Hamilton: An American Musical: OH MY WORD. I SAW HAMILTON. I was counting down the days to seeing the hit show of the year, another Tony winner. You could say this year was the Hamil-Tonys, and in fact many had! It won award after award, and the musical theatre world has revolved around it since it opened last summer. We had nosebleed seats, all the way at the top of the balcony, but I didn’t care. Many of the original cast left the show earlier in July which was disappointing, but it was still so solid. Thrilling choreography, great music, a phenomenal cast, and a talkback afterward? Yes, please. I loved it! There were a few things I would have changed, and I’m sure my experience would have been different if I had been closer to the stage, but it definitely lived up to the hype. On Your Feet: The Story of Emilio and Gloria Estefan: Honestly, I had no expectations for this show. I knew nothing about the story except it was based on real people, and after the dance class/mock Broadway audition we had with the choreographer I knew there would be Latin dancing. But, honestly? It was one of my favorites of the week! I recognized WAY more of the music than I thought I would, I danced in my seat, I swooned over the actors, and I instantly downloaded the soundtrack. OH. SO. GOOD. It’s been on repeat since I got home. Shuffle Along: This was our Saturday matinee. It is a musical about a musical, and you could tell it was written for Audra McDonald. Unfortunately, we had her understudy, but it makes complete sense. The show was set to close at the end of the week because Audra was going on maternity leave, and she was no longer doing two shows per day. I don’t blame her. The show was fun though, the tap-dancing incredible, but it really depended on star power to push it forward. It was a bit lackluster without her. Fun Home: Our final musical of the weekend was last year’s Tony winner, Fun Home. It’s based on the life and comics of Allison Bektal. This was our first and only show in the round, which meant the stage was in the center of the room with the audience all around. It featured another group of talented kids, some crazy set changes with pieces coming up through the floor and disappearing down below. It, too, is closing, so I’m glad I got to see it before it left Broadway. I cannot wait to go back to the conference next year! Our workshops were stupendous and so varied: Shakespeare, puppet theory, Latin dance, curriculum. I left feeling so inspired ESPECIALLY with a new job on the horizon. Have you seen any of these shows? If not, get yourself to Spotify and listen to the soundtracks! They're still rocking my world!